George Bernard Shaw called him a colossal genius. Pope Pius XI called him a devoted son of the Holy Church and a gifted defender of the faith. A dominant figure in English letters during the first third of this century, G.K. Chesterton was a prolific writer whose great range of personal interest and intellectual involvement makes his writings of almost universal appeal. Though he produced nearly 100 books in his lifetime, Chesterton considered himself primarily a journalist, writing articles for 75 different British periodicals and for about 50 different American magazines. His huge literary output includes social commentary, detective stories, biographies, religious and philosophical argumentation, humorous writing and nonsense verse, economic and political writings, literary criticism, novels and short stories, plays and poetry. This anthology, which is arranged thematically, features a judicious selection from a wide range of Chesterton's works, including excerpts from Orthodoxy, a selection of his poems-humorous, religious, and social/political-and passages from the popular Father Brown detective stories. Also included are excerpts from Chesterton's many essays, on subjects ranging from Catholic schools, women's rights, and heresies, to fairy tales, advertisements, and George Washington and the cherry tree. A selection of short quotations displays the epigrammatic wit that plays through all of Chesterton's writings and makes him a joy to read. Witty, wise, and eminently quotable, Chesterton not only addressed the time in which he lived, but continues to speak significantly to our time. This volume, which culls much of the best and the brightest from his works, will delightChesterton aficionados as well as all who appreciate likable genius. 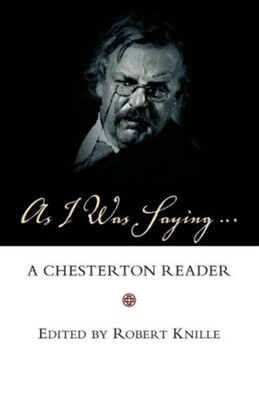 ROBERT KNILLE was a lifelong Chesterton enthusiast. About ten years ago he founded the first eastern chapter of the Chesterton Society, and he remained its chairman until shortly before his death in 1983. Knille authored numerous articles on religion and literature as well as a bibliography of U.S. publications about Chesterton. I'm the author/artist and I want to review As I Was Saying: A Chesterton Reader.